The fourth ASUCR senate meeting of the quarter took place on Wednesday, Oct. 17 in HUB 221 at 6:30 p.m. in order to discuss current affairs and vote on the three nominations to fill the Judicial Council. Large scale building projects on campus were also discussed. All except CNAS senator Josiah Davis were in attendance. After approval of the agenda, Assistant Vice Chancellor of Housing Services Andy Plumley presented to the senate about the UCR Long Range Development Plan Team’s new housing projects. 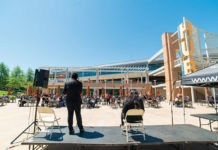 The UC Riverside Dundee Residence Hall and Glasgow Dining Project, which will begin construction this year, aims to provide 820 new beds for freshmen as well as new dining options for students. The project will be built where Lot 22 is currently located, and will also provide new seminar and multi-purpose rooms. The new dining hall will have 830 seats across two floors, and will replace the A&I dining hall which will be closed. The space formerly devoted to dining at A&I will be refitted to host programs for dining hall residents. Plumley further discussed the North District Development Project, which includes the new residential facilities. This project involves redeveloping approximately 50 acres of land on UCR’s North District. The project’s goal is to expand facilities to accommodate increased enrollment over the next few years, as well as existing housing needs. According to Plumley, the new projects will not impact traffic by providing additional parking as well as drop off and pick up zones. Housing Services also implemented a “no freshman parking policy” last year to help with traffic in general as well. The project is set to open in 2021. Next on the agenda, the senate heard brief speeches from judicial nominees. Third-year political science major Sarai Fuentes, a former judicial fellow, spoke about her experience in the judicial branch and her goals of ensuring that decisions “best reflect not only the constitution but also … the interest of the community.” Second-year political science and administrative studies major Heidi Awada then spoke about her experience in student government and goals, which included “upholding the constitution more,” suggesting that it should be amended more regularly. Finally, third-year business administration major Richard Huang, the former secretary of the court, spoke of his experience as a Nordstrom sales representative and the communication skills he gained because of that. His goals included ensuring the “proper interpretation of our constitution,” and that “all branches are upholding it to the best of (their) ability.” All three nominees were elected unanimously. Resolution SR-F18-001, or the Student Democracy Day Resolution, was then passed unanimously. This resolution ensures that there will be no school on Nov. 6 to allow students to vote in the midterm elections. 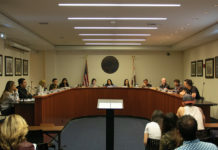 Next the UC Student Association (UCSA) gave its annual presentation in which Salih Muhammad, UCSA’s Statewide Organizing Director, covered the purpose of the UCSA as a way for students to mobilize and have their voice heard within the UC system. Some of the campaigns talked about included support for Racial Justice Now, increasing support for undocumented students and promoting UCweVote, which helps provide students with information about voting and encourages registration. During senate reports it was announced that there will be an open house on Oct. 25 to give the student body an opportunity to get to know the student government and its functions better. 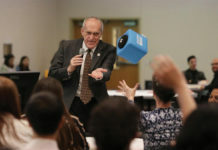 Senator Kenneth Thai briefly discussed plans to reach out to former senators about hosting a research expo, which he hopes to have in early spring. Senator Sara Al-Khalili met with the organization Period to discuss its goals of providing more access to menstrual products on campus, and mentioned that the Student Voice Committee would like to hear from students about the amount that these products would be used. The meeting concluded at 7:47 p.m. ASUCR meets every Wednesday at 6:30 p.m. in HUB 221.